Maju Express is a fast emerging express company based in Larkin, Johor Bahru. Maju Express is one of the express bus company which is very popular among the bus operators in Peninsular Malaysia. 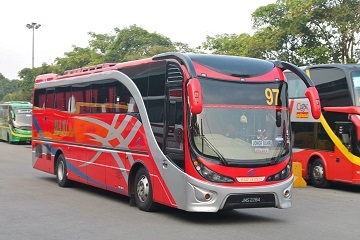 Maju Express offers about 70 bus routes per day departing from Johor to various states in Peninsular Malaysia such as Perak, Kuala Lumpur, Terengganu and Pahang. The buses depart from Kota Tinggi to Dungun, Pasir Gudang to Dungun, Pasir Gudang to Kuala Kangsar, Pasir Gudang to Sri Manjung, Pasir Gudang to Teluk Intan, JB Larkin Terminal to Teluk Intan, Pasir Gudang to Kota Tinggi, Johor Bahru Larkin Terminal to Sri Manjung, Johor Bahru Larkin Terminal to Kota Tinggi, Kota Tinggi to Pekan Pahang, Johor Bahru Larkin Terminal to Terminal Bersepadu Selatan, Kota Tinggi to Kuantan Pahang and many more. The bus ticket fare which the pick up point and drop off point is within Johor state cost about RM 2.9 to RM 7.30. The bus ticket fare from Johor to Kuala Lumpur is about RM 34.3 to RM 37.2 . In addition, the bus ticket fare is RM 21.9 to RM 33.2 when the express bus departs from Johor to Pahang. The bus ticket fare is RM 52.7 to RM 64.1 when the express bus departs from Johor to Perak while the bus ticket will cost you RM 38.8 to RM 48.7 when you depart from Johor to Kuala Terengganu. All of the buses operate by Maju Express are in single deck with 30 seats or single deck with 44 seats. 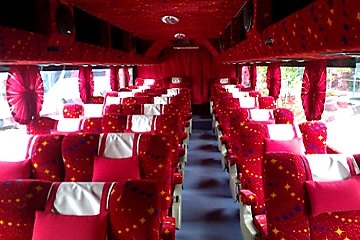 The buses are in equipped with air-conditioning with comfortable seats. All of the staffs hired by Maju Express are well-trained in order to provide the quality services to the passengers.